Sevierville, TN -- Back again for its twelfth year, Sevierville’s 12th Annual Bloomin’ BBQ & Bluegrass Festival (May 20 & 21, 2016) has released its entertainment lineup, including a headline performance from Mountain Faith Band, 2015 finalist from NBC’s America’s Got Talent. Sevierville, TN -- Sevierville’s Bloomin’ Barbeque & Bluegrass festival (May 15 & 16, 2015) has announced the entertainment lineup for its eleventh annual event, including a headline performance from famed bluegrass group, Steep Canyon Rangers. The Most Wanted Names in Bluegrass: Doyle Lawson, J.D. Crowe, Tony Rice, Bobby Hicks, Todd Phillips, The Bluegrass Album Band and more will all come together May 17 & 18 at the Sevierville, Tennessee Bloomin' Barbeque & Bluegrass event. 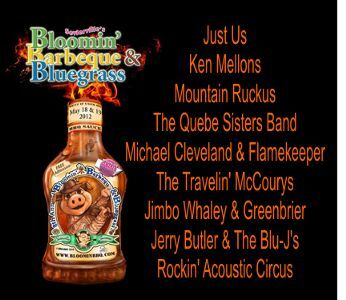 Sevierville, TN -- The two-day lineup for the 8th Annual Bloomin' Barbeque & Bluegrass Festival is finalized. The event will be held on May 18 and 19 in Sevierville, Tennessee and will feature The Travelin' McCourys as the headlining act of this year's festival. The Bloomin' Barbeque & Bluegrass Festival has been named a Southeast Tourism Society Top 20 event for the month of May.